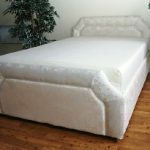 We can supply either traditional style hospital beds with pressure relieving mattresses or bespoke electric beds in a choice of bases inclusive of premium quality memory foam mattress. The latter can be fitted with profiling action as well if requested and can be ordered in single or a variety of double bed sizes. 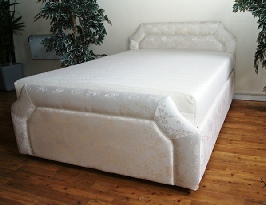 The Chatsworth is a beautifully hand crafted deep divan bed, designed with relaxation and comfort in mind. 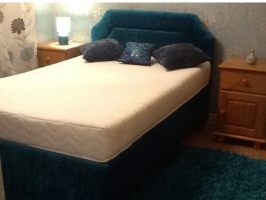 This classic divan features double arched sides for hoists and over-bed table access. It is finished with a fully padded floor to mattress surround and is complimented by an upholstered headboard and footboard. Price includes a deep, opulent memory foam mattress. The exquisite Haddon bed comes with a fully padded surround and a full floor to mattress base, offering the perfect deep divan style option. Designed with practicality and comfort in mind, the Hardwick bed is a traditionally styled divan, benefiting from the option for single or dual actions. 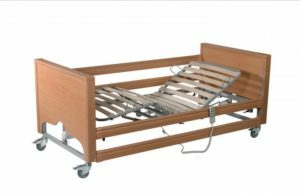 Supported by highly polished teak legs and ideally suited for hoists and over bed tables giving ample clearance, the Hardwick is manufactured using the finest birch hardwood. The Hardwick bed comes complete with headboard and a luxurious 8” memory foam mattress. 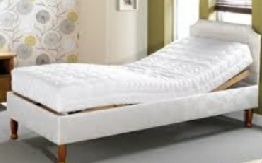 This best-selling bed is beautifully finished with enclosed motors and a curved wooden head and foot board. The bed is adjustable in height between 40cm – 80cm (16″ – 31″), enabling carers / nurses to care for users successfully, without bending and causing back injuries.